I was first introduced to Dawn Siebel's artwork, when she submitted these nostalgic paintings of grade school photographs and track housing from the '50's to the Amherst Biennial curatorial committee. 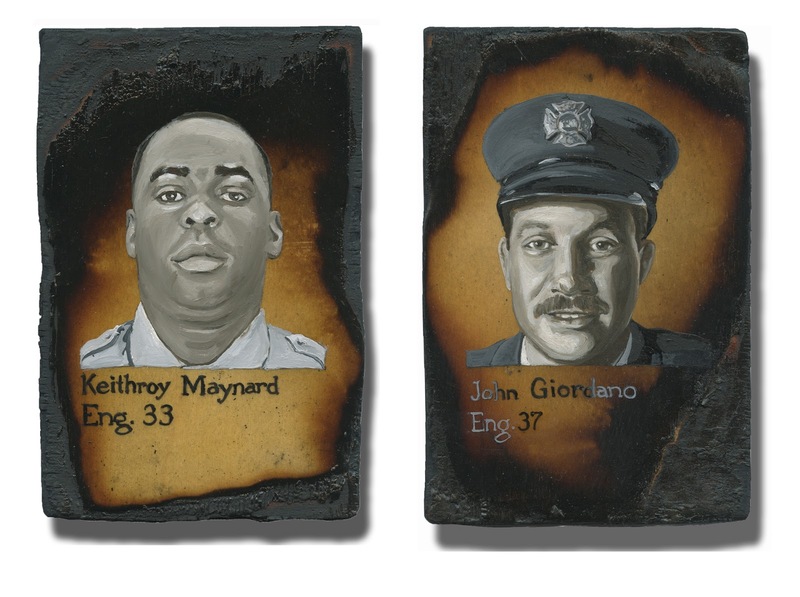 Shortly afterwards, during a studio visit, she shared a selection from her monumental work, Better Angels, the Firefighters who were killed on 9/11. This series really hit home for me personally, since I grew up in NYC and my mother had worked in the World Trade Center in the '80's. Dawn's dedication to this work is extraordinary, she mortgaged her home, so she could focus exclusively on this task at hand. She worked tirelessly, researching each firefighter, working meticulously to capture the essence of each individual firefighter, sometimes reworking some portraits several times. The curators were so impressed with this series, that we included a select few of the Better Angels portraits in the Frost Museum Library, Amherst College for the Amherst Biennial. It's so wonderful to finally see this monumental installation locally in the Pioneer Vallery. Better Angels will be on view in it's entirety at the Springfield Museum until July 10, 2016. This is not to be missed.